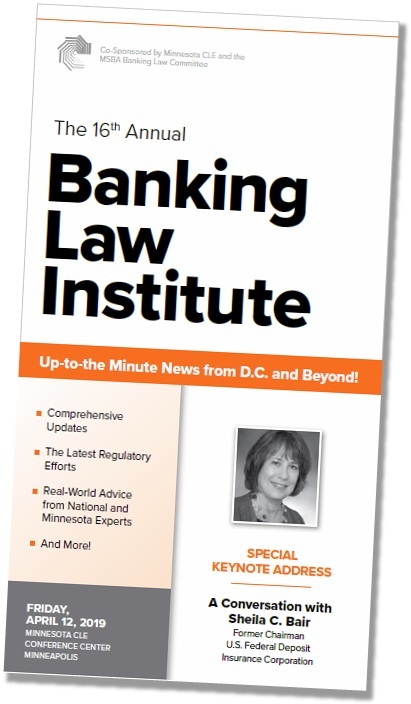 Get up to speed on the most important banking law developments at the April 12 Banking Law Institute. #1 Outstanding Education and Expert Faculty! Regulatory updates, M & A Trends, Developments in Minnesota Banking, Agricultural Lending Update, BSA/AML Enforcement and Compliance, Data Breach Planning and Data Privacy News, Representing Financial Services Companies in the 21st Century - see the brochure for details! Don’t miss this moderated discussion on the national’s financial system and the challenges and opportunities ahead. It’s the perfect chance to catch up with your friends and colleagues in a fun, informal setting – including lunch (with remarks from Minneapolis Mayor Jacob Frey) and a reception! Minnesota Contracts Deskbook, 3rd ed.